Got Bent or Damaged Wheels? Are the wheels on your vehicle bent, have curb damage, or cracked? Quit rolling around on a hazard and come by Nitrous Garage in Pomona, LA county to get your wheels fixed. Our techs will remove the wheels from your car and check them for all types of damage. Whether it be a crack or bend they can revive them to like-new condition in only a few hours. Don’t spend thousands on a new set of wheels when we can get your set of alloys looking like new! Apart from fixing your wheels we can refinish them any color you would like and fix and curb rash that they may have! We are located by the intersection of the 57 and 60 freeways in Pomona. We are close in distant to LA and orange county. Call us today and get an appointment setup for your wheel repair: (909) 869-5681. 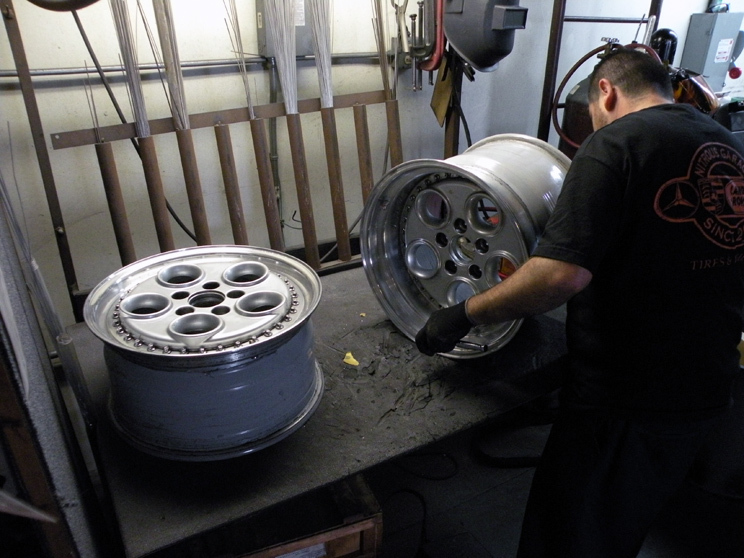 Seen below is one of our expert technicians working on a set of factory Lamborghini Diablo wheels. If our techs can fix lambo wheels you bet they can fix whichever ailments your wheels have.